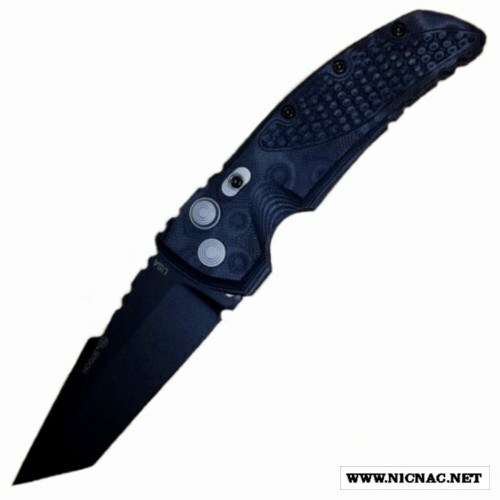 Hogue 34129 EX-A01 Side Opening Automatic Knife with a 154-CM Tanto Blade and a G-10 handle with what the creators call a G-Mascus Black design along with a piranha texture for a better grip. This Hogue side opening knife is overall open length 8.00 inches with a 3.50 inch clip point flat grind blade. This Hogue Knife has a 4.75 inch G-10 handle. It is for a right hand user with a tip down large tip up or tip down reversable pocket clip and is MADE IN THE USA! It is an Allen Elishewitz design.